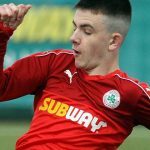 A Joe Gormley strike midway through the first-half was enough for Cliftonville to get the better of Carrick Rangers at a windswept Belfast Loughshore Hotel Arena. On a day when the Reds had to battle against the elements as well as their opponents, the visitors – backed by the strong breeze in the first-half – laid siege to the Carrick penalty area with a string of deliveries from distance and, with home goalkeeper Harry Doherty time and again getting his angles right, it was left to Gormley to make the breakthrough when he pounced to lash home from eight yards. 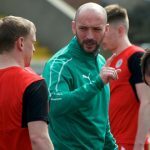 Carrick attempted to use the wind to their advantage after the turnaround but the Cliftonville defence held firm and, with keeper Brian Neeson’s handling impeccable, ensured there would be no late nerves. The visitors went close to taking the lead with just three minutes on the clock, but Doherty produced a fantastic flying save to touch a deflected Ruairi Harkin blast onto the crossbar. With Carrick struggling to get out of their own half thanks to a combination of the strong wind and being pressed high by the Reds, a teasing Harkin delivery across the face of goal found no takers in the middle before Conor McDonald sent an attempt over the top. A series of corners kept the home defence busy before the deadlock was broken when a Chris Curran cross caused havoc in the area and, when Gers skipper Mark Surgenor’s inadvertent touch teed things up for Gormley, the Cliftonville striker made no mistake with a firm first-time finish. Harkin, McDonald and Jay Donnelly each threatened to double the lead but a single goal was all the Reds had to show for their efforts at the interval – offering Carrick serious encouragement as they prepared to play with the breeze behind them. Cliftonville dealt with the situation well, though, and the only real moment of concern came when Darren Henderson took a penalty box tumble under a challenge from Neeson, who was deemed by referee Evan Boyce to have played the ball. Indeed, the Reds might have doubled their advantage late on when substitute Jude Winchester raced through and got a telling touch that sent the ball inches wide of the post before Gormley could capitalise. Gers keeper Doherty, injured attempting to quell the danger in that last-minute incident, was stretchered off and all at Cliftonville naturally extend our best wishes for a full and speedy recovery. 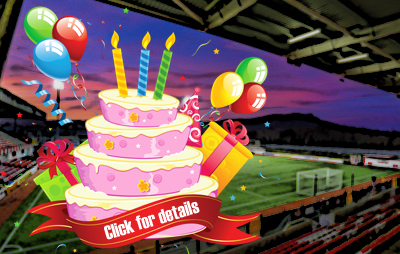 Cliftonville: Neeson, McGovern, Breen, Harney, Curran, Harkin, Gormley, J Donnelly, Lavery, Grimes, McDonald. Subs: Dunne, Ives (Breen, 20 mins), Bagnall, Winchester (McDonald, 72 mins), R Donnelly (Lavery, 66 mins).